Wedged between Sea/Iona Island and Richmond is the Middle Arm of the Tidal Fraser River. It remains unnoticed as it flows through the heart of one of the busiest hubs in Vancouver. Tens of thousands of commuters travel across it daily without realizing that good fishing can actually be had. Middle Arm is just another one of many spots in the Tidal Fraser River where one can spend a few hours to wet a line after work with a good chance of catching some quality fish. Middle Arm begins from Oak Street Bridge to Terra Nova Park. There are many access points along the entire stretch. River Road in Richmond, west of No. 2 Road to the end, offers plenty of parking and easy access to the river. South of Sea Island, west from the end of Russ Baker Way, also offers good fishing spots. The section east of Gilbert Road bridge does not offer good shore access due to limited parking and occupied shoreline. Fishing in Middle Arm is typically good between late March and November. Bull trout and coastal cutthroat trout fishing is available year-round, but it is best during spring and fall. Coarse fishing is best between June and September. Although salmon fishing is better in North and South Arms, it can also be done between September and November. During odd years, pink salmon often make their way into Middle Arm during the incoming tides between mid August and September. Coho and chum salmon fishing is available in October and November. Because Middle Arm is one large channel with no small bays and smaller channels, the current can be quite swift when the tide is moving. It is best to plan your outing around flood tide (between two hours before and after). A mud flat exposes along the shoreline when the tide is low, so fishing is not possible unless you intend to wear a pair of waders. Please be aware that the mudflat maybe soft, so watch your footings. Coarse fishing is best done with a bottom rig, to counter the tidal current. Cast your rig slightly further out than normal, so it is free from the weedbeds in the shallow portion of the river. Anchoring a piece of bait such as dough ball, worm, shrimp may result in catches of peamouth chub, northern pikeminnow and shiner perch. This fishery is best done on a warm summer day. When targeting bull trout and cutthroat trout, casting small spinners and spoons with a light spinning rod is your best option. Retrieve your lure faster when it approaches sure to avoid hooking up the shallow bottom, but be prepared for a strike as many predatory fish have a tendency to hide in the shallow water. Flyfishing is also possible. Many locations along Middle Arm provides sufficient amount of space for casting. Although there is a current, only a floating line is required as the river within the casting range is shallow. Small minnow patterns and large sculpin patterns are productive. Select your fly based what the fish maybe feeding on. 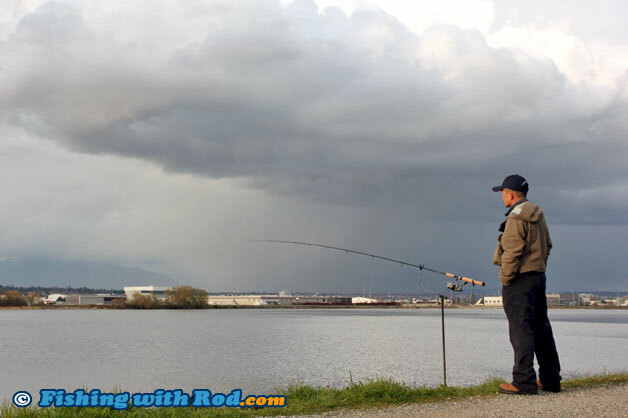 Fall salmon fishing can be done by other spincasting lures or bottom fishing with roe. Plan your trip for the last three hours of the incoming tide, when salmon tend to move into the river. Middle Arm is located in Fisheries and Oceans Canada's Area 29. Please read the general tidal fishing regulations and Area 29's regulations. The salmon fishing openings are usually announced during the season, so it is always best to check for opening times and other restrictions before heading out. Please respect other users and local residents by keeping the area clean.